The "Taijiquan Jing" is the first text of the seminal Taijiquan Classics. The following entry and its annotations have been taken from some of the best translations and commentaries made on the original texts. These sources are sited in the footnotes and in the list of Sources directly below. 1. When moving the body, it should be light and nimble, with all its parts linked together like pearls in a necklace. 2. Arouse the qi in the body and extend it; mental awareness (shen) is to be gathered internally. 3. Body postures should be aligned properly with no distortions of any kind. Body movements should be continuous without stops and starts. 4. Internal energy (Jin) should be rooted in the feet, generated though the legs, directed by the waist, and expressed through the fingers. Jin is a Chinese martial arts term for the combination of muscular strength (“Li”) and Qi (“inner energy”) to create physical power and force. [editor’s note]. Ch'i [qi] carries tremendous amounts of vibration, requiring a high degree of coordination of the entire body. Your torso and limbs, your hands and legs, must be coordinated both physically and mentally with every other part of the body. All the parts should relate to each other as one inseparable unit, especially when you transfer your ch'i [qi] from the root upward. Success in this will allow you to maneuver your entire body – forward, backward, upward, downward – at will. You will be able to control any situation. [Liao, 1995, p.67]. 5. If timing and position are defective the movements will be confused and disordered. The problem is to be corrected in the legs and waist. 6. Up and down, forward and back, left and right should be directed by Yi [clear mental intention]. “Yi” has a host of related meanings: mind – intent – idea – meaning – thought – think – wish – desire – expect – anticipate. All could be applicable in taijiquan. [editor’s note]. 7. When attacking up be aware of down; when advancing forward don’t lose sight of retreating; when striking left pay attention to the right. Movements are to be regulated by Yi and not by brute force. By pulling and pushing the foundation of an opponent, he can be uprooted and fall over. 8. Empty and full should be clearly determined. Where there is one there should be the possibility of the other. The body through every joint should be intertwined together without the slightest break. Empty is Yin; full is Yang. Qi as the ultimate force in the universe manifests itself in the continuous conflicting and balancing of the two. 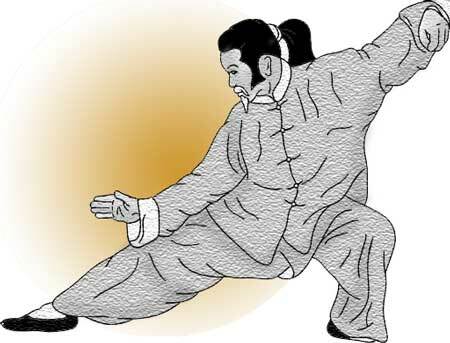 In Taijiquan when weight is place on one leg it becomes yang while the other leg should be light [yin]. Likewise when an opponent attacks (yang) you should withdraw (yin). The parts of the body strung together like the links of a long chain enable you to gain enormous strength and mobility. [editor’s note]. 9. In Long Boxing, the body [from its internal energy] moves like water flowing in a great river, or like the rolling waves of a large ocean. Long Boxing (chang chuan or changquan) is an early name for what developed into Taijiquan. It literally means “long fist.” [editor’s note]. 11. [An occasional annotation to the text reads:] This treatise was left by the patriarch Zhang Sanfeng of Wudang Mountain so that worthy people everywhere may achieve not only the martial skills which are but the shell of this art, but actually achieve longevity. One story of Master Zhang’s birth: On the 1247 Ninth lunar midnight [midnight April 4th, 1247 CE]. Zhang’s mother dreamt that a crane flying from the East China Sea fell on the roof. Her husband said, “This is an omen that our son is about to be born." Suddenly the mother went into labor and the baby quickly appeared, very large and healthy. The father ran from the house to see a crane sounding loud and noisy cries, flying three times around the house before flying away. The young Zhang was given the surname Jun [Lord] Bao [Precious Jewel]. ^ Qi is the ultimate eternal energy that moves the universe. “The human being, also a part of the universe, is powered by the same source of energy—ch’i [qi]…. It is the development of ch’i in the human body along with the theory of the contrasting powers of Yin and Yang, that makes the art of T’ai Chi [taijiquan] such a unique mental and physical system of discipline…. Ch’i is to T’ai Chi what gasoline is to a gas-powered engine. Just as without gasoline the engine could not have been invented, if there had been no concept of ch’i development, the art of T’ai Chi would never have come to be.” Waysun Liao. T’ai Chi Classics. 1995. pp. 23-24. Michael P. Garofalo. Eight Trigrams. Ibid. Thirteen Postures of Taijiquan. Ibid. Treatise on Tai Chi: The Principles of T'ai Chi Ch'uan, attributed to the Taoist Master Chang San-Feng. Master T.T. Liang. T’ai Chi Ch’uan: For Health and Self-Defense. Knopf Doubleday, 2011. Stuart Alve Olson. T’ai Chi According to the I Ching. Inner Traditions, 2001. Benjamin Pang-Jeng Lo. The Essence of T’ai Chi Ch’uan: The Literary Tradition. North Atlantic Books, 1979. David Roth-Lindberg. The Tai Chi Classics, part I: Taijiquan Jing. Lee N. Scheele. T'ai Chi Ch’uan Ching: Attributed to Chang San-feng (est. 1279 -1386). Taijiquan Jing – The Taijiquan Classic, translated by Sam Masich. Note: It is said that Zhang Sanfeng created the “Taiji 13” which is the basis of Wudang internal martial arts. Although this may be a legend and not historical fact, nevertheless, the modern versions of this form most likely carry some of the spirit and practice of Master Zhang and his followers. The following are videos of this form: Wudang Sanfeng 13 Taiji quan Zixiaogong ; Wudang Tai Chi 13 Form Sanfeng ; Wudang San Feng tai chi 13 form ; and Wudang Taiji 13 tutorial [in spoken Chinese].